Open Policy Making is about better policy making: being open to new ideas, new ways of working, new insights, new evidence and experts. 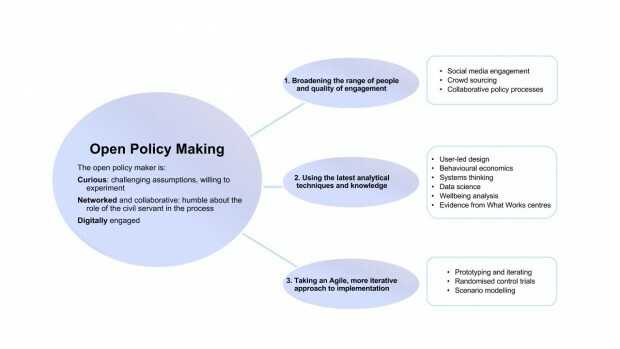 The open policy maker talks to a broad range of people and experts, uses the latest analytical techniques, and takes an iterative approach to implementation. Open policy making is about opening up the whole process to new ideas, techniques and voices - not just about transparency and public opinion. Different levels of openness, approaches and tools are suitable for different policy issues. Different issues need different approaches to open policy.